What means does civilization employ in order to inhibit the aggressiveness which opposes it , to make it harmless, to get rid of it, perhaps? …aggressiveness is introjected, internalized; it is, in point of fact, sent back to where it came from—that is, it is directed toward his own ego. Since the beginning of this season, Mr. Robot has been subtly (and not-so-subtly) exploring the idea of how illusion plays a vital role in reality. I’ve talked repeatedly in these reviews about the way in which the show undercuts Elliot’s ideas, how it exposes his need for illusion at the very moments when he’s denouncing such shams—most notably during his rant against organized religion during Bible study. 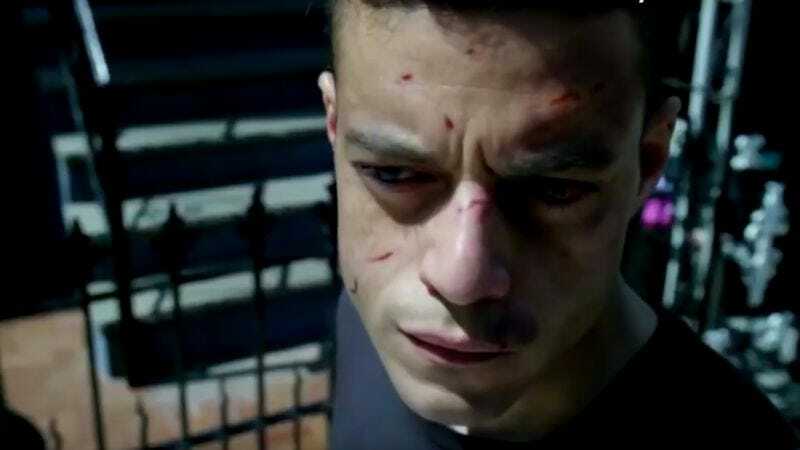 Elliot Alderson is continually inveighing against illusion, scorning its “escapist comfort,” as he calls it tonight, during the final moments of “h4ndshake.sme.” And much like those earlier moments, he knows the hollowness of the barb. Sure, it can seem like cheap fantasy, but that’s not all it is. Last week, illusion spared Elliot untold amounts of pain. That realization finally broke a safeguard in his mind. He’s letting the illusion drop. But Elliot’s illusion was always double. Sure, he constructed a fantasy, one in which he went home to stay with his mother, where he build a routine for himself, and tried to purge Mr. Robot from his system. But that was only half of the fantasy. He knew full well the illusion in which he was participating—it was the act of overlooking the fantasy that maintained his connection to reality. We still saw what we saw, but the falsehood of the environment was merely a way to structure the truth playing out simultaneously. That’s why Elliot’s argument about using screens to block out reality doesn’t quite match what we’ve seen: Screens, masks, fantasies—they don’t block out reality, or hide ugly truths. They shape reality, and make truth accessible. Without the fantasy, Elliot wouldn’t have made it this far. It’s only by going through the fantasy, and fully embracing the illusion, that he (or we) has any way of experiencing reality. Elliot’s also apologetic for what he sees as deceiving us, and that’s fair. We suspected something was off, but we had no idea what. Unlike Elliot, we didn’t know the whole story of what lay behind his illusion. But he shouldn’t feel too bad—after all, we won’t be apologizing for knowing about the scenes and situations we’ve seen play out without Elliot’s knowledge. And while Elliot sounds earnest in his desire to trust us once more (“That’ll be the last time I keep things from you”), he can’t promise what he doesn’t know. And he doesn’t know himself; not completely, anyway. He’s convinced Mr. Robot is his partner now, but I’m not so sure. Sure, Christian Slater digs deep into a vein of empathy in his performance, and has Mr. Robot deliver a plausible story about killing Tyrell Wellick, using the much-teased gun buried in the popcorn machine at their Coney Island hideout. But only Elliot promised no more secrets. Mr. Robot made no such assurances. And the red flag highlighting Robot’s possible dissembling comes in his explanation to Elliot. The one about why he shot Tyrell. He reminds Elliot that Wellick was talking about killing a woman, luxuriating in the experience, the tactile sensation and feelings of power it gave him. Mr. Robot warns Elliot they would’ve been next, that Tyrell was talking about how they were gods. But that’s the very job Robot chose for Elliot. The young hacker as deity, his imaginary father the prophet, delivering a message of liberation from capitalist exploitation. And the show delivers this homily weekly. Tonight, it was Ray. The man who we now realize is most likely a prison guard tells Elliot explicitly: “I thought I was gonna be your savior.” But Ray had it backwards. When Elliot looked at the site, it forced Ray to break the cycle of denial that set in when the money began rolling in. He was forced to confront his own actions, and he couldn’t live with them. Elliot saved him. Elliot the savior. God access. And if Elliot’s holy tendencies shone through in that chess game, then this episode was his book of Revelations. After burning his notebook REDWHEELBARROW in his totem’s red wheelbarrow (curious to see what object is on the other side of that fantasy), he’s beset by the skinheads intent on more than just payback. This narrowly averted sexual assault revealed more than just Leon’s badass knife skills. It showed that Leon is not only connected to Whiterose (and the Dark Army, presumably, by extension) and has been watching over Elliot all season long. It reveals something much more valuable than information: friendship. Leon is on Elliot’s side—always—and his sense of loyalty to the troubled guy who has listened to his theories on Seinfeld for weeks on end is one of those rare moments of light in this story. Leon’s an avenging angel, always at the right hand of the lord. And now, having fulfilled his duties, he returns to the heavenly flock to await his next task. While Elliot waits to be released (and judging by Krista’s response to that letter, my guess is he’s getting out next week), Angela is playing multiple roles, and even she isn’t quite sure which side she’s on. There’s a long game surfacing in Angela’s behavior, but she’s just not good enough at hiding her intentions. This is conveyed most clearly in her interaction with Dom. The FBI agent knows something is up with Angela, from the moment she witnesses her leaving the restricted area—and probably well before that, because honestly, Angela’s a person of interest no matter what. “Your story fascinates me,” Dom tells her, while Darlene waits anxiously on the other end of the phone. That’s because Angela is fascinating. She works with Darlene, but she also knows Darlene used her. Ms. Moss lashes out at Darlene this week, and her insecurity and sense of not belonging suffuse every inch of her history with the Alderson children. Her suspicion that the two of them thought they were “smarter” than her, her anger at always being left out of their close-knit world, even her awed acknowledgement that Elliot and Darlene are behind Fsociety…it all shows just how alone Angela feels. She feels abandoned by her best friend, despite the small steps of progress they made in “logic_b0mb.hc,” and now that Darlene is offering up any answers Angela wants, most of those answers remain unsaid, because Angela doesn’t want Darlene to speak. She wants her to listen; more than that, she just wants to be heard. And understood. Unfortunately, her new boss in Ecorp’s risk management division has a little too much understanding. He sees through her seemingly casual offer to prepare a briefing on past cases, knowing as he does that the daughter of a victim of the Washington Township event is in no way disinterested in the details of that lawsuit. And he has no compunctions about letting her know where she stands. Phillip Price told him he could do whatever he wanted with Angela, and that realization stings—as does the assumption that Price’s order may have resulted from her rebuffing his offer to celebrate his (secret) birthday. But it suggests what we already suspect: Even cold-hearted sadists can feel wounded. Seeing Angela and Price, framed low in front of the blue painting, makes them both look adrift, unmoored, and searching for stable ground. It’s a visual counterpoint to the even larger blue painting that backgrounds Elliot and Krista’s conversation, right at the moment of Elliot’s reveal of the prison. Everyone this week is made small by the works of art behind them, as though the illusions and imagery are overwhelming them, and minimizing their perspectives. Even Joanna Wellick is confronted by loneliness. Mr. Robot’s own Lady MacBeth is acting very much like someone who needs her own connection with another, as her gift of divorce papers to Derrick demonstrates (or at least gives the appearance of demonstrating) her desire for him. Perhaps it’s just the aftereffects of being splashed with red paint by someone screaming “capitalist pig!” in her face, but Joanna seems to be running out of patience for her waiting game. While the others recede into the frame, Joanna occupies the center, but it’s almost worse: Her screams are muted, her pain goes unheard. It’s an ironic situation for a woman who is even in control while she’s being choked in bed. She’s in charge of literal repression of her voice, but out there in the world with us, her cries don’t make a sound. What makes “h4ndshake.sme” such a beautiful episode of Mr. 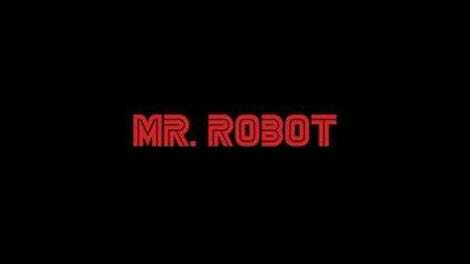 Robot isn’t the big reveals, or the profound allegorical relations between characters, or even the virtuoso use of music this week. It was the return of Elliot’s relationship with us, the unseen, unnamed passenger in this story. We have a role to play, but when Elliot lost his faith in us, it shook our connection to him. It threw cold water on that ineffable trust that bound us to him, and made us even more uncertain than we already were about what was happening onscreen. “I trust you again,” and that sense of trust is important, especially on a show built upon layers of deception and illusion. We need a mooring, or else we—like Angela, like Elliot, like the rest of them—shrink before the size of the work of art unfolding in front of us. It can be cold not having a friend. Thankfully, Elliot is ours again. We may not know the truth, but we’ll settle for trust. That “Hello. I see you” from the beginning was quite the fake-out, turning into an analysis of handshakes, rather than some confession of our presence. Much like the reveal of Mr. Robot being dead last year, the brilliance of the prison reveal was less in the actual unveiling (many of you suspected something was afoot, though I gather many of you were like me, thinking it was actually a halfway house or some such) than in the way the camera transitioned the illusion. Angela’s encounter with her dad was as fraught as full of double meanings as a moment with a parent could be. His loss of respect, her frustration and sadness at his disillusionment, all of it played marvelously. And painfully. “I’ve seen you talking to him.” Another great moment when the woman leading Bible study gives him a moment alone. Elliot, small and dominated by that massive “You are not alone” sign, captured something spare and elegant about his character. There are a lot of places we can go from here. I’m not sure what the next move is, but something tells me that even if we saw it coming, Sam Esmail would already be looking for a better one.